Turar Ryskulov (1894—1938) — Soviet politician; the chairman of the Central Electoral Committee of the Turkestan Autonomous Soviet Socialist Republic. 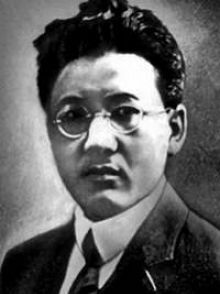 Turar Ryskulov was born on 26 December 1894 in East-Talgar volost of Semirechensk Province in natural boundary Besagash (now — Talgar District of Almaty Province), nationality - Kazakh. During the Soviet Revolution he founded Turkish Communist Party. He defended that all the Turkic nations should organize in one state and one communist party. His policy was rejected and his party was ordered to join Russian Communist Party. He was executed in 1938 during the Great Purge being accused of being a National Communist like Sultan Galiev. Today he is considered a national hero and honored with a large statue at the entrance of Kazakhstan Economic University in Almaty (Reph, 2008).